Authors Boomerang4Israel Where are the innocent Palestinian Protesters? Where are the innocent Palestinian Protesters? It’s the right question to ask in these difficult times here in the Middle East. Where are the innocent Palestinian protesters? And, if the protesters aren’t innocent, who are they, what are they? Take a look at Boomerang’s latest video. For too long, Israel has walked the moral path in two ways. First, it works very hard to ensure that it does all it can to minimize injury to innocent non-combatants. That’s actually redundant. All non-combatants are innocent and all innocent people are non-combatants. Essentially, the real problem in the latest violence is that the protesters are not innocent. And since they clearly come WITH weapons, they aren’t unarmed either. The second thing that Israel does as a moral country, is recognize when it has made a mistake. It issues an apology and does what it can to rectify what has been done. Since these protesters are NOT innocent, no apology is needed, nor will it be issued. To understand why, watch this video. And please share it far and wide. Sadly, the international media rarely posts about missiles fired at Israel – except when they hit something. That’s what happened this week – the Palestinians fired rockets and hit a kindergarten a bit after seven in the morning. On most days, children typically arrive within minutes of the time the rocket hit. Israel’s greatest nightmare. Thankfully, one adult was lightly wounded but no children were in the area when the mortar smashed into the ground, propelling shrapnel all around the kindergarten. 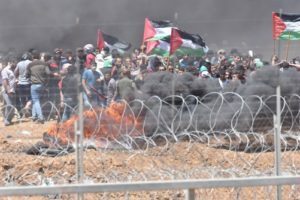 This video poses a simple question – are the Gaza protesters innocent? The answer won’t surprise you. We all know the answer. We would guess that even the United Nations and European Union know the answer. Politically correct responses notwithstanding, those who hurl burning tires and attack the border fence of a foreign nation are combatants, nothing less. When you go to a “peaceful” protest, you don’t bring knives and explosives. You don’t attack property and attempt to storm a border. Watch the video – it’s great! And congratulations to Boomerang4Israel on yet another clear and excellent video! Please, keep them coming! Boomerang Says it Like it is – in Arabic!